This two day workshop seeks to systematically outline and guide you through, some of the fundamental principles that lead to a comprehensive proficiency for drawing the human figure. 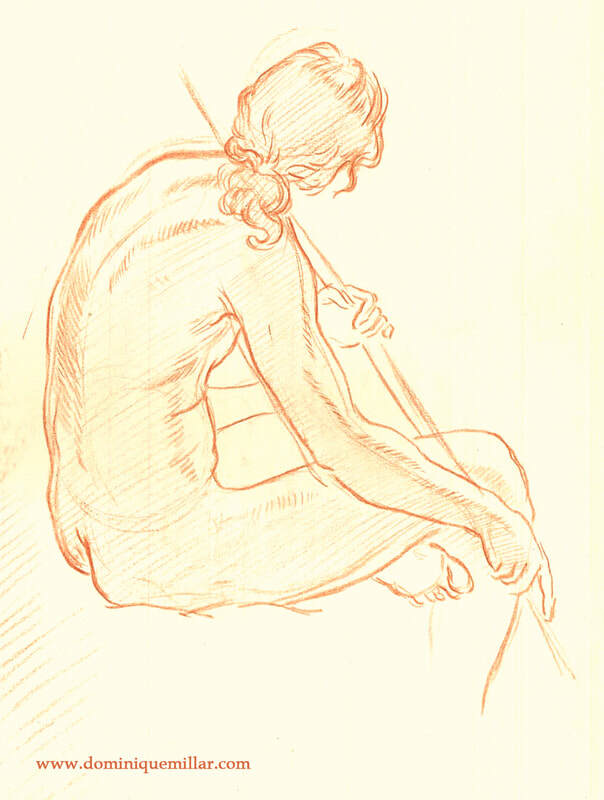 The practice of life drawing will be analysed in terms of geometry and perspective; the figure’s gesture, weight and action; the role of convexed lines to suggest volume and a brief analysis of human anatomy, starting with the major masses of the skeleton and concluding with an analysis of each major muscle groups of the human body. Morning Class – The human figure and linear direction: With a life model in the morning, we will start with stick figure drawings – an invaluable tool in describing the major centre lines of the human figure – we will gradually work towards conceiving the human form in terms of two directional lines and basic geometric shapes, such as cylinders and cubes. Afternoon Class – The Charles Bargue drawing course and the figure as directional lines: In this class, we will look at how a Nineteenth Century drawing course undertaken by Van Gogh, Seurat and Picasso can help us to better simplify the basic forms of the human figure. Morning Class – Gesture and action with basic anatomical masses, landmarks and limited convexed contours: We will examine how the life model’s action relates to the directional weight of any pose. Basic skeletal masses and landmarks will also be examined. Afternoon Class – Basic anatomy and the figure as line and contour: Directional lines will begin to be replaced by more undulating convexed descriptions of form. We will consider how line and overlapping convexed contours can suggest volume without necessarily the need for shaded rendering. The major muscle groups of the human body will also be introduced. Identify how the placement of the model’s weight coincides with the figure’s action. Understand and grasp the processes of conceptualising, selecting and creatively inventing from the figure. Have the ability to apply a basic knowledge of human anatomy to figure drawing, including the basic skeletal masses of the figure and muscle groups.